Antisemitism doesn’t exist in Toronto. Or so Alexandra thought, until, at a high school basketball game at a partner public school, students threw money at her and her teammates as they waited for the game to begin. Since then, she created a program called the CJPAC Generation: Student Leaders to increase high school students’ engagement in Canadian politics, a program that now brings together hundreds of students across the country. 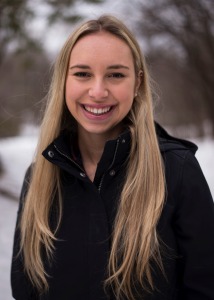 Alexandra is pursuing a career in the field of policy because of “an innate feeling of duty and responsibility for the community.” The Toronto community and Jewish day school system gave her a strong footing in her Jewish identity and helped shape her priorities in life. Alexandra Brenner is completing her master’s degree at the Munk School of Global Affairs and Public Policy, with a collaborative degree in Public Health Policy at the Dalla Lana School at the University of Toronto.